Chilean photographer Sergio Larrain has transformed the medium of photography, lending the practice an artistic quality that had previously been inconceivable. Larrain traveled through Europe and Latin America searching for what he called the “state of grace” – an elusive state that combines both serenity and spontaneity – that he sought to capture in his photographs. His endless traveling led him to become known as the “Vagabond Photographer”, but he later quit photography and his travels in favor of solitary meditation. This deeply meditative aspect of his personality is evident in his photographs, which take seemingly mundane, everyday events and transform them into profound, romantic reflections on human emotion. 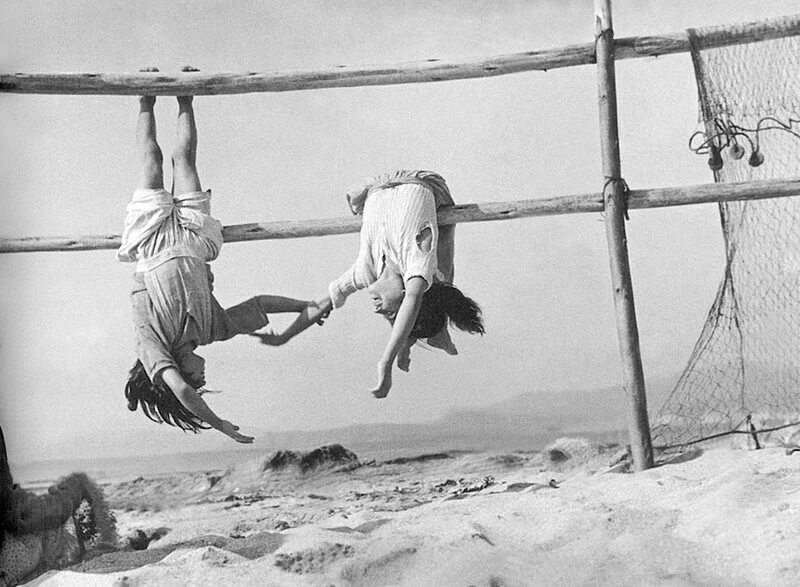 This photograph from the village of Los Horcones in Chile captures two fishermen’s daughters on the beach. The girls are playful, laughing freely as they reach towards one another and dangle precariously from the fence. The tilted perspective of the photograph adds to this nonchalant, lighthearted atmosphere, emphasizing their exhilaration. However, their excitement is muted by the monochromatic coloring of the photograph – the faded grays and the graininess of the photograph subdue these emotions and imply that the scene is more of a distant memory from the past than an immediate reality. The carefree playfulness is further subverted by the very prominent raggedness of the girls’ clothing, which brings to mind the poverty of the remote Chilean countryside. It was this imaginative, innate ability to layer such complex meanings and emotions within a single photograph that made Larrain so influential in the field of photography, which had previously been considered less emotive and more static than other artistic methods of representation. His poetic approach to understanding and capturing the ordinary allows the emotions of his subjects to break through and, as a result, inspires the viewer to connect with their own. How do his photographs make you feel? The two girls embody all there is to innocence. Their carefree nature is evident in the photograph but also the precariousness of their situation. So quickly, one of them could fall yet something about their smiles gives off confidence that they will hold on. It’s as if the photograph is a visual interpretation of the threshold of adolescence — the introduction to maturity which so many who have already crossed look back and regret their haste.